Life can be ruff but pulling out this collection for a future project will definitely improve your outlook. Have a barking good time with the modern, angular styling of the pooch quartet that makes for easy coloring allowing you to experiment with color combos and coloring techniques. This 15 piece set includes: Cocker Spaniel 1 3/8" x 1 1/2", Schnauzer 1 7/8" x 1 1/2", Bull Terrier 1 3/4" x 1 5/8", Poodle 2" x 1 7/8", Large bone 3/4" x 3/8", Small bone 1/2" x 5/16", Single paw print 1/4" x 1/4", Dual paw prints 1/2" x 7/16", Have a Barking Good Birthday 2 5/8" x 1/4", Happy Birthday from the Dog 2 9/16" x 1/4", Sending Kisses and Cuddles 2 7/16" x 1/4", You're Dog-gone Awesome 2 3/8" x 1/4", We'll Be Friends Furever 2 1/8" x 3/16", You Deserve a Treat 1 11/16" x 3/16", A Treat for You 1 1/4" x 3/16". Clear stamp sets include the name of the set on the sticker for easy identification. Our clear stamps and Die-namics are made in the USA. 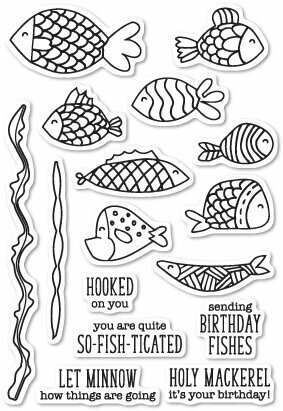 Clear stamps from Memory Box featuring many fish, the sentiments "hooked on you", "you are quite so-fish-ticated", "sending birthday fishes", "holy mackarel! it's your birthday!" and more! 4 x 6 inch stamp set. 16 clear stamps included. 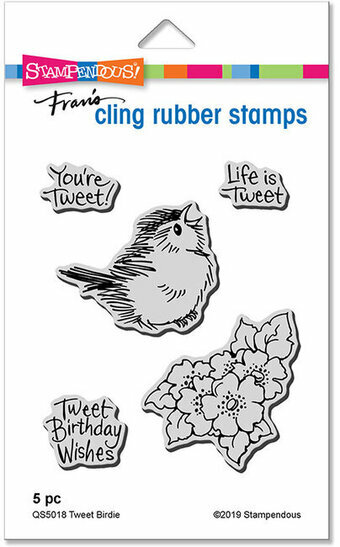 Send some spring wishes with this clear stamp set. Includes couple running with wheelbarrow, dancing gardening lady, gnome, work gloves, gardening tools, and sentiments "Another year older and still playing in the dirt" "It's birthday thyme!" "There's gnome-one like you!" "You're the best! Gnome sayin'?" "I'm so excited I wet my plants!" "Lettuce celebrate!" "I dig you" Crazy gardening lady!" 3 clear stamps on a 2.5x2 inch storage sheet. 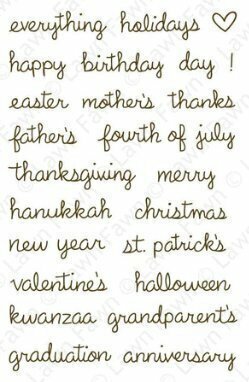 Features birthday candles and the words "Happy Birthday", "To", and "From". 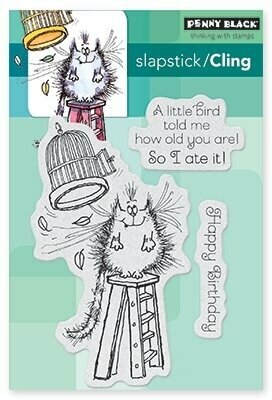 Clear stamps from Picket Fence Studios featuring the sentiment "Happy Happy Birthday". Unique, beautiful and creative stamps designed by Nicole Petersen. Use with paints and inks. Perfect for card making, journaling, scrapbooking, and mixed media. Designed by Danielle Walls. This fun 3x4 hand lettered stamp set has a great bold HOORAY! to help celebrate those special moments! From the Heart (9 clear stamps) - Stamp Set Size 4" x 6". Features a heart, "Be Happy", and "You Are Beautiful". Personally designed by Leonie Pujol. Clear stamps from Uniquely Creative featuring mermaids, a dolphin, "Best wishes and mermaid kisses", and more. Clear stamps from Uniquely Creative featuring birthday sentiments, an astronaut, a rocket, a spaceship, planets, aliens, and more. Birthday sentiments are one of the most utilized sentiments in the craft room, and it's every card maker's desire to have a well-rounded collection! 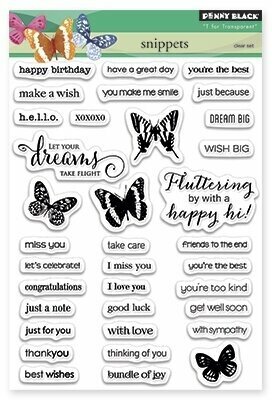 The Special Birthday Sentiments Cling Stamp Set provides you with a fantastic selection of greetings affording you the perfect sentiment for handmade cards celebrating your friends and loved ones on their special day! 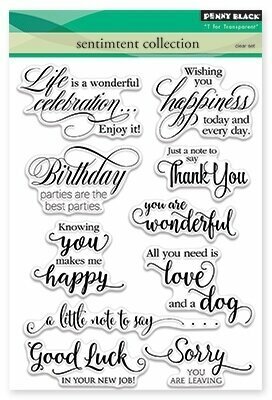 A variety of fonts mixed with handwritten script come together to create a timeless appearance, making these sentiments a collection that you will often reach for in the many years to come! Approximate Image Sizes: 1. Wonderful Birthday Sentiment: 3.5" x 0.75", 2. Birthday Love Sentiment: 1.0" x 0.75", 3. It's Your Birthday Sentiment: 1.5" x 1.0", 4. Happy Birthday Sentiment 1: 2.5" x 0.5", 5. Happy Birthday Sentiment 2: 2.25" x 0.75", 6. Happy Birthday Sentiment 3: 1.0" x 0.5", 7. Special as You Are Sentiment: 2.0" x 2.5", 8. Special Day Sentiment: 2.0" x 1.0", 9. Happy Birthday to You Sentiment: 2.5" x 3.0". 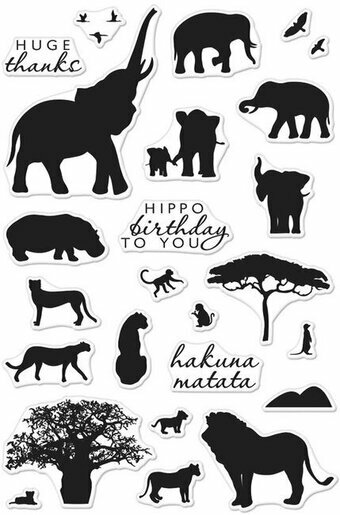 Unmounted Rubber Stamps from Art Impressions featuring a stack of turtles and the sentiment "Hope your birthday stacks up to be wonderful". Clear stamps from Memory Box featuring a candle and the sentiments "wishing you", "a happy birthday", "you and happiness", and "a happy retirement". 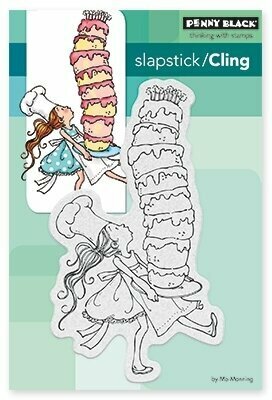 2 x 3 inch stamp set. 5 clear stamps included. Penny Black slapstick cling stamp featuring a wizard and a birthday greeting. "How do you wrap a hug? Happy Birthday"
You're allowed to be a little shellfish on your birthday. 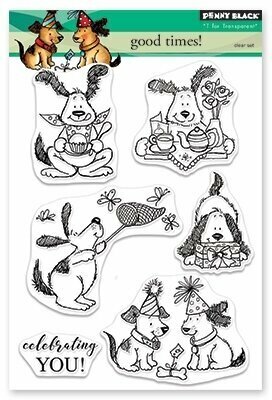 This cute set of clear stamps was created to celebrate Lawn Fawn's sixth birthday. This stamp set coordinates perfectly with Year Six Lawn Cuts custom craft dies. Approximate stamp sizes: [cute clam] 1"W x 7/8"H, [it's your] 1 5/16"W x 3/8"H, [birthday] 1 3/8"W x 3/8"H, [(be a little shellfish)] 2 1/8"W x 1/4"H. Made with care in the USA!